This is a beautiful Elevation Designs dress. 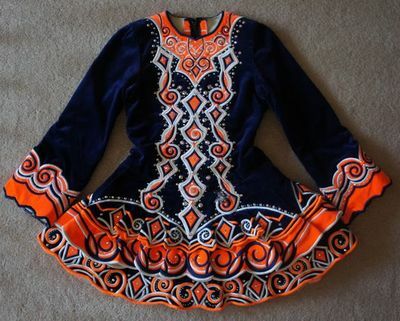 It has a navy blue velvet bodice with bright orange, white and navy embroidery. It is adorned with hundreds of AB swarovski crystals. We are the second owners. 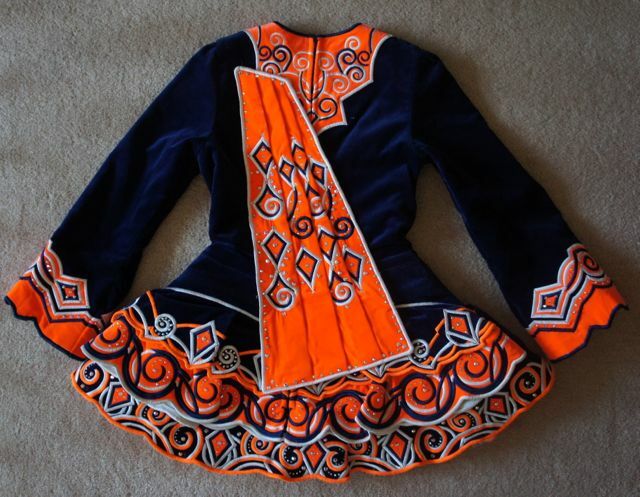 The dress itself and the embroidery are in great condition. The lining is a bit discolored due to use and the bottom ruffle is currently unattached due to fit for my daughter. It is in good condition as well and can easily be reattached. 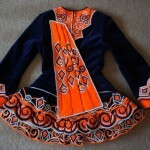 The photo shows the dress with the bottom ruffle included. We would be happy to send more photos upon request. Thank you! The bottom ruffle is currently unattached. My daughter was too short so we removed it. The measurements read as if it WERE attached. The bottom ruffle can easily be reattached by a seamstress.